As California cannabis legalization grows closer, less familiar products like topicals and tinctures are growing in popularity as effective healing alternatives. 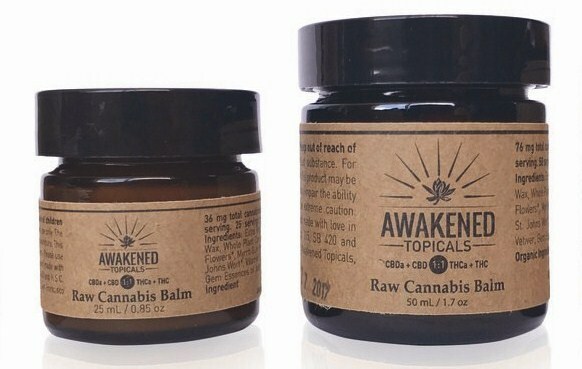 Here we’re highlighting one of the more unique MMJ topical companies, Awakened Topicals. Let’s check them out! Based in Los Angeles, “the original raw cannabis company” believes in providing the very best cannabis products to showcase the power of plant-based medicine. Awakened Topicals strives to make effective, long-lasting all-natural topicals and tinctures using only the highest quality ingredients. Their attention to detail and individualized customer service proves their genuine interest in the healing journey of all of their customers. A pity this ethos of quality, sustainability, and community was born out of misfortune. Years ago founder Levi Strom had a life threatening surfing accident that required emergency spinal surgery and a long recovery. As a result, he was prescribed many pharmaceutical painkillers, though was allergic to most of them. Lucky for Levi, his doctor suggested a cannabis topical to help ease the pain. Only the highest quality ingredients go into Awakened Topicals’ products. All cannabis used is sourced from sun grown, small batch farmers in California; and each of their partnered farms uses the latest organic growing methods, so you can trust no chemical solvents, pesticides, fungicides or fertilizers are used. An added bonus: their farmers take extra care to make the lowest possible negative impact on California’s natural resources. Every product is made using raw or cold-pressed whole plant cannabis. By not using extreme heat to decarboxylate the cannabis, they preserve some of the most important cannabinoids like THCa, CBDa and other beneficial terpenoids and flavonoids normally burnt off by high heat extraction. Awakened believes their role as herbalists is not to manipulate mother nature, but simply be its messenger, bringing you medicine the way she intended. Their products are tested by an accredited California lab that conducts cannabinoid and terpene profiling, as well as screens for pesticides, solvents and microbiological contaminants. They even publish testing results to promote transparency, a very refreshing and reassuring detail. Once crafted and tested, they’re packaged in UV ray protective jars (except the portable pain stick) to further optimize shelf life. Their earthy, minimalistic packaging will look at home next to your natural skin care and lifestyle products. Products come with a shelf life of one year after opening. To maximize their lifespan, store your balm, tincture or pain stick in a dark cabinet, drawer, or even your refrigerator. 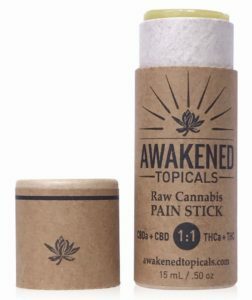 The company produces three versatile raw cannabis products: pain stick, balm, and sublingual tincture. Their non-psychoactive pain stick (about $30) packs serious healing, combining thirteen active whole plant ingredients like cannabis, aloe, jojoba oil, St. John’s Wort, and vitamin E. It’s idea for reducing back, joint and muscle pain; as well as a wide range of additional ailments, including psoriasis, burns, bites, bruises, and wrinkles. Also try using it as chapstick when dry; it leaves a pleasing taste! This incognito, travel-size product comes in a 15 mL applicator (0.5 oz) that can easily fit in your pocket or purse. It’s great for getting those hard-to-reach places and there’s virtually no greasy residue (they’ll be some on the packaging). Just push the stick up from the bottom to reveal as much medication as needed and apply liberally. This topical lives up to its reputation, which is why it won first place at the 2015 Emerald Cup. Also made with thirteen active, whole plant ingredients and hot poured by hand, the raw cannabis balm is safe to apply to your face, feet, hands, under arms, hair—almost anywhere. Harnessing a 1:1 CBDa to THCa ratio gives all the benefits without the high, perfect for all-day relief. Plus it’s vegan, gluten, and paraben free. Like the pain stick, the raw balm can be used to treat a wide variety of issues, including sore muscles, arthritis, acne, eczema, and stretch marks. But unlike the pain stick, your hands will get a little greasy. If it’s a problem just comb those oily fingers through your hair. Don’t let it go to waste. Choose between two sizes: a 50 mL jar (1.7 oz) with 76 mg of combined cannabinoids ($25-30) or a 25 mL jar (0.85 oz) with 38 mg of combined cannabinoids ($45). This sublingual is another Emerald Cup winner. It’s made with single strain and origin cannabis from Emerald Triangle, processed using Awakened’s signature raw cold infusion process to ensure the extract will be rich with CBDa and THCa. It’s blended into extra virgin olive oil made on Awakened’s own estate and is completely vegan, gluten, and paraben free. However, the tincture is only very mildly psychoactive, with many patients barely noticing the psychoactive effects. It’s an effective natural option for serious chronic pain relief and inflammation. While these claims aren’t supported by the FDA, the sublingual has proven effective in treating symptoms of osteoarthritis, rheumatoid arthritis, fibromyalgia, social anxiety disorders, depression, PTSD, multiple sclerosis, and can be an effective sleep aid. A 30 mL bottle (1 oz) with 270 mg total of combined cannabinoids ($60) roughly translates to 30 servings at the recommended serving size of two drops to one full dropper. Start with two drops under the tongue every six hours, then increase as needed. You can also add it to your favorite foods and drinks. Awakened Topicals’ MMJ products are available in several California dispensaries as well as through their patient membership program. You can also use Nugg’s medical marijuana delivery service to find local dispensaries that carry and deliver Awakened Topicals straight to you. It’s free to sign up, but you must have a valid medical marijuana recommendation before ordering. Still don’t have a valid cannabis rec? Don’t worry, NuggMD makes it easier than ever by having licensed cannabis doctors available online seven days a week. After meeting the criteria and being doctor approved via live video conference, you’ll get your medical recommendation for only $39. Then visit Nugg and instantly start ordering! “I want to thank you again for your ‘Raw Body Balm’ product. As you know, I have a rare skin disease called ‘Papular Dermatitis’ and your ‘RBB’ is the only natural product that has been able to provide me with relief. It is absolutely amazing! I have suffered for years until this ‘balm’ of yours came along. Please let your customers know that this salve can work miracles on any type of skin rash, scar or other skin defect. Thanks for creating a remedy that is truly miraculous and life altering!” —Anthony U. “I’ve always been curious about the power of cannabis balms and salves for combination and problem skin. After using the raw balm for a few days I noticed a difference in smoothness and skin tone. And it’s great for burns and bruises! Truly a convenient topical cure-all.” —David S. “Miraculous!!! Your topical is like nothing I have ever used before. I had thrown out my low back for the first time…and all my other “biologique” products were just not working. Your product works almost instantly, lasts a long time, and it takes such a small amount to be effective. My boyfriend is equally amazed with your product, he is an ashtanga yoga man who blew out his shoulder and has been in constant pain for more than a year, so he thanks you!” —Cindy E.